Green house cleaning service Better Life Maids will be participating in the third largest Earth Day Celebration around the world on Sunday April 22nd. 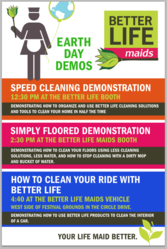 Better Life Maids will be hosting demonstrations of green cleaning and ways to make a home a safer place. St. Louis Earth Day Festival is the third largest celebration of Earth Day worldwide. Held on the grounds of the outdoor Muny theater in Forest Park, Better Life Maids will be among hundreds of exhibitors demonstrating ways to live a more sustainable lifestyle. The event is free and open to the public. Along with general education about the Better Life line of natural household cleaning products and the benefits of using a green house cleaning service, Better Life Maids will be hosting demonstrations on safe and sustainable cleaning practices. The first will be at 12:40 p.m. at their booth under the Muny pavilion. They will be demonstrating "speed cleaning" techniques that homeowners can use to save time while maintaining their home. "We are really excited to be a part of this year's Earth Day Celebration. We are really looking forward to sharing some great techniques and best practices with our visitors on Sunday. With practice, a homeowner can cut the time that it takes to clean their home in half. With some of that saved time, they can implement some of the other great things they learn at this year's festival," stated Angela Ricketts the Vice President of Client Experience for Better Life Maids. "These are not short cuts, but patterns and processes that help you to be more efficient and focused when cleaning." Some of the things that Ricketts goes on to describe including systems for organizing supplies, using the right tools for the right jobs, and patterns that avoid wasted backtracking. The next demonstration will at 2:30 p.m. at the Better Life Maids booth. This demonstration will show how Better Life's Simply Floored product can be safely used to clean all the flooring surfaces in a home. "We will also be demonstrating a technique that homeowners can use to avoid spreading around dirty mop water, and contaminating surfaces. Our approach to mopping is a big improvement over a string mop and a dirty bucket of water," explained Ricketts. The final demonstration will be at 4:40 p.m. at the Better Life Maid's Chevy Volt. The Volt will be part of the electric vehicle display highlighting various modes of alternative transportation. Ricketts goes on to describe the benefits of cleaning vehicles with all natural products, "The Better Life products are perfect for cleaning your car. They have no solvents or alcohol so you don't have to worry about damaging surfaces, and they do a great job of keeping your car looking great." Better Life Maids is a green house cleaning service founded in St. Louis, MO. It has created a unique marketing partnership with Better Life a natural household cleaning products manufacturer. Together, they are working to create the first national name brand in natural household cleaning products and green house cleaning services. Better Life Maids is expanding in select markets through a franchise development system. For more information, visit http://www.betterlifemaids.com or http://www.cleanhappens.com.